BTCRobo Bitcoin Exchange is a SCAM! Don’t exchange your bitcoins with BTCRobo until after you read our unbiased review! BTCRobo, found at BTCRobo.com, is a the latest Bitcoin exchange scam that will steal your bitcoins without a seconds hesitation. Posing as a genuine Bitcoin to PayPal exchange, users believe they are exchanging their bitcoins to PayPal cash payments for an exchange fee of only 1% but that is not the case at all! BTCRobo is a thieving Bitcoin “exchange” that will break their promise about exchanging your bitcoins and will leave you high and dry. According to the “About Us” section found on btcrobo.com, BTCRobo is a Bitcoin exchange service where everyone with a PayPal account can exchange bitcoins to U.S. dollars. They are composed of a small group of professional Bitcoin network and market analysts and have allegedly been in existence since 2014. Eventually as time progressed their group become larger and started to comprise of people who were highly-skilled programmers, designers, support staff, etc. Robin Teo Morris is the alleged founder and CEO behind BTCRobo. What we found interesting though would be how Robin Teo Morris has no presence on any reputable social media outlets such as LinkedIn, Facebook or Twitter. One would think that if the CEO of a seemingly legitimate Bitcoin exchange did exist that he or she would at least possess some sort of social media footprint. Furthermore, the site appears to have been registered through NameSilo with a privacy blocker. This privacy blocker enables the individual or company behind this site to remain anonymous so finding out whether or not “Robin Too Morris” is the actual registrant behind this domain is beyond our powers of finding out. If we had to make a logical assumption in regards to the role of this alleged founder it would be nothing more than to serve as the scapegoat to this thieving and phony cryptocurrency exchange. The credibility of BTCRobo becomes non-existent if you take the time to conduct a little research. A simple search query of “BTCRobo scam” in Google search will revel that BTCRobo is not the exchange you may have been looking for. In fact, the further you dig into the legitimacy of this scam the more the credibility of this phony exchange site crumbles. Victims have been piling up at an exponential rate to the BTCRobo thieves! Here we have coppolaemillo, who put their faith with this service only to have their 0.1BTC stolen. More disturbing news would be that this isn’t the only individual who had the unfortunate experience of putting their faith with the BTCRobo exchange service. Below is another case of someone who feel victim to this ridiculous scam. Their experience can be found at bitcointalk.org and as you will see that person wasn’t the only one who got scammed by these crooks. No factual information is provided about the owners of the site. 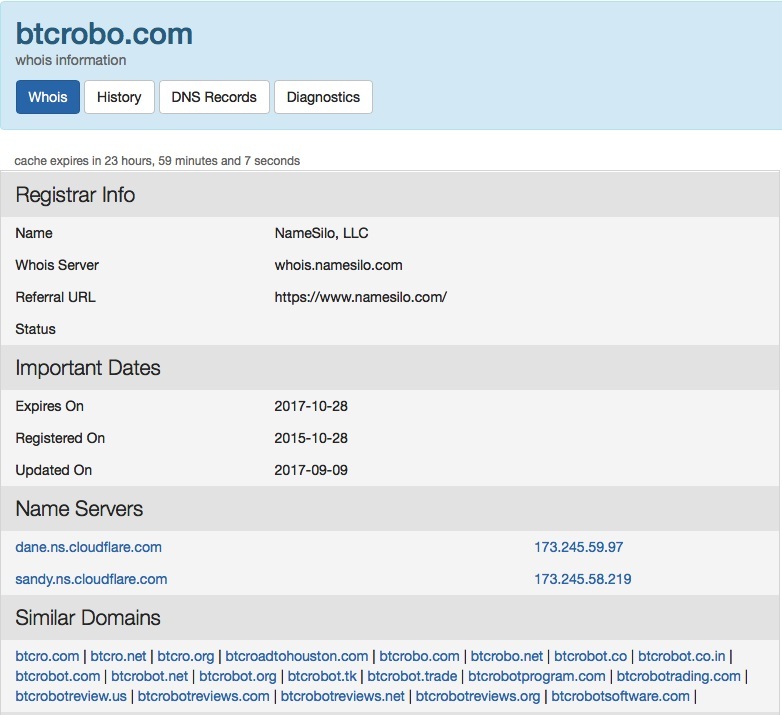 As previously mentioned, the crooks behind this system employed an anonymous hosting package through NameSilo making it extremely difficult to narrow down the true identity of the registrant. However, the employment of this anonymous service did bring up the notion that BTCRobo is probably not the first scam system launched by these conniving thieves. During the time of writing this review, btcrobo.com possessed a SimilarWeb global rank of 9,891,431, indicating it was not a very popular site. We were able to figure out that many of the visitors viewing the site reside in Italy. According to btcrobo.com their headquarters are based out of Singapore. In addition, they claim that they are registered as a limited liability company (LLC) within the United States, Germany, Singapore and United Arab Emirates. As we have pointed out already, things aren’t what they seem in regards to this phony exchange service. In addition, no physical, email, or company address are provided which allows this service to remain completely anonymous. Thanks to WHO.IS, we were able to learn that btcrobo.com was created on October 28th, 2015. However, in the “About Us” section on the site they claim to have been around since 2014. Even if you browse the History and DNS Records found on who.is you will see that no presence of this site existed before 2015. This is just another white lie piled with the many deceptive elements found on the site. Does the site incorporate shady marketing techniques? Oh absolutely! Total anonymity would be the biggest problem regarding this site. Remember, if a company is unwilling to be open and truthful about who they actually are then they aren’t a company worth trusting. It is evident that the creators behind this scam don’t have your best interests as heart. Another interesting trait we discovered would be how btcrobo.com rotates these Bitcoin addresses. So although it appears that their site is living up to their word of exchanging bitcoins for instant PayPal cash payments they are actually just misleading your further away from your bitcoins. Are any credible sites correlated with the website? Although we weren’t able to match any of the follow sites IP addresses or registrant companies we did learn that a considerable visitor overlap between btcrobo.com was found between these following sites: btctopp.com, cointopal.com, havebitcoin.com, 247buybitcoin.com and coin2pal.info. Due to this correlation we are advising that all investors avoid not only BTCRobo but all the sites found correlated to it! More likely than not each of these sites are scams that cannot be trusted! In light of everything we have discussed we believe that it is quite evident that BTCRobo is a Bitcoin exchange scam! The creators behind this site rely on total anonymity to get away with scamming people out of their bitcoins and we can only hope this review saves some of you from falling victim to this phony exchange site. To date they have appeared to scam around 35 bitcoins from innocent people, don’t become a statistic with this viral exchange site! Verdict: BTCRobo is a SCAM! Have you been scammed by BTCRobo? Share your experience and feedback by leaving a comment below. Don’t forget to subscribe to ScamBitcoin.com to receive our reviews and warnings via email.